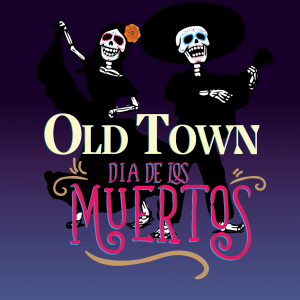 Old Town, San Diego —The annual Dia de los Muertos (Day of the Dead) will be celebrated in Old Town on November 1-3, 2019. This free event will include the traditional candlelight procession on November 2nd starting at 6PM, beginning at the entrance of the Old Town State Historic Park, located at San Diego Avenue and Twiggs Street. The procession will travel down San Diego Avenue to El Campo Santo Cemetery. Many restaurants, businesses, museums and shops will be creating over 50 traditional and contemporary Dia de los Muertos altars. Unique altars will honor historic Old Town figures, as well as more current stories. A public altar will be located in El Campo cemetery where visitors are encouraged to add their own mementos, photos and written tributes to loved ones. Free parking is available throughout Old Town. The best Place to park is at the Cal Trans parking lot on Taylor . The lot is open to the public all day on weekends and after 5 p.m. on weekdays.